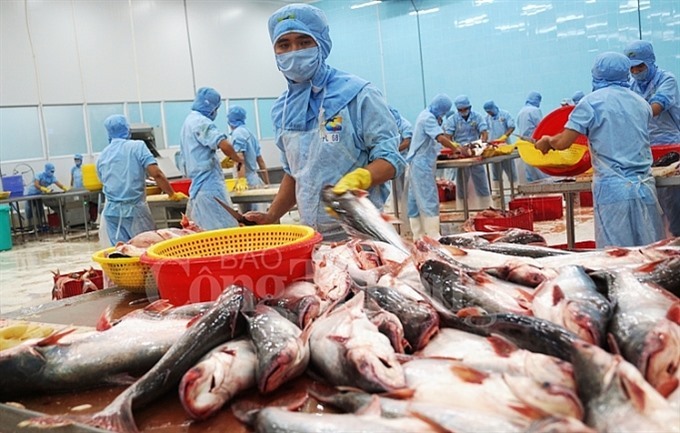 HÀ NỘI – Tra fish export value is expected to exceed US$2 billion this year, higher than the industry’s target, due to the US-China trade war, according to experts. Trương Đình Hòe, general secretary of the Việt Nam Association of Seafood Exporters and Producers (VASEP), said tra fish exports will continue to increase in the last months of this year so total export value will reach $2.1 billion, up 22 per cent compared to 2017. The export value of this product in the first nine months of the year surged year-on-year by 24 per cent to $1.6 billion, the association said. According to a report recently released by Rồng Việt Securities Joint Stock Company, Việt Nam’s fisheries and tra fish in particular are benefiting from the US-China trade war and from reduction of tariff imposed on some Vietnamese seafood. Meanwhile, China has also cut import tariffs to meet domestic demand. Hòe was quoted by congthuong.vn as saying that from late September to now, the price for raw material of tra fish in the Cửu Long (Mekong) River delta has stood at VNĐ35,000-36,000 ($1.5-1.55) per kilo. With that price, farmers earn from VNĐ6,000 to VNĐ9,000 per kilo. However, they have faced a shortage of raw material for export processing because many farmers have stopped tra fish production as they lack fingerlings, Hòe said. Nguyễn Thị Ánh – director of Sông Tiền Seafood Company (SOTICO) – agreed there is a lack of raw material of tra fish for export processing by the end of this year. Therefore, her company has not signed more export contracts for tra fish products with foreign partners. “There is not enough high quality fingerling of tra in the market, making increase in price of fingerling and affecting supply of export tra fish in the last months of this year,” Ánh said.